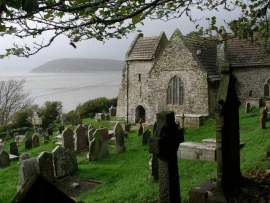 "A view across the graveyard at St Ishmael's Church - geograph.org.uk - 1574796" by tristan forward - From geograph.org.uk. 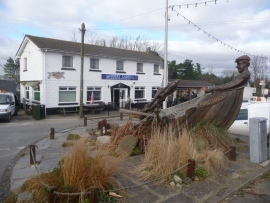 "Ferryside, sculpture and the Ferry Cabin - geograph.org.uk - 1181863" by Chris Downer - From geograph.org.uk. 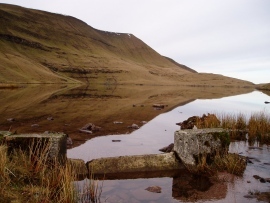 "Llyn y Fan Fawr" by Original uploader was Blisco at en.wikipedia(Original text : David Gruar (Blisco)) - Originally from en.wikipedia; description page is/was here. (Original text : own work). 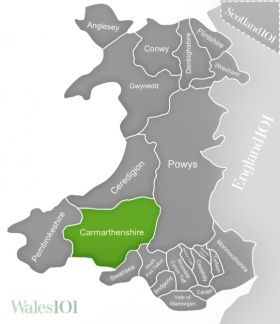 Known as the Garden of Wales, Carmarthenshire is the third largest county in Wales. 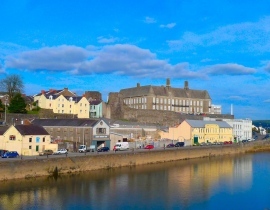 The three largest towns are Llanelli, Carmarthen and Ammanford. There is something for everyone, the area is rich in history, natural beauty and literature. For literary buffs, the Dylan Thomas Birthday Walk is a must. Found in Laugharne, it is based upon Poem in October and features several look out points. The wooden seating at these various stop points have stanzas from the poem carved into the wood. The Tin Shed Experience is a second hand tin sheeted museum housing wartime memorabilia from 1914-45, with the collection including film props from Band of Brothers and Saving Private Ryan. Designed to look like a shelter from the war, the victory garden features a full Anderson Shelter. The Dinefwr Castle and Park is a 800-acre National Trust estate complete with a Bog Walk Boardwalk, Mill Pond, Newton House, Tea Rooms, a courtyard shopping area and parkland walks. There are panoramic views of the Towyi river from the castle, and a chance to get up close to the dragonflies buzzing around the pond. The trails are suitable for all the family, and tracker packs are available for the children to help discover the surroundings. There is an exhibition in Newton House, telling the stories of times gone by. You can have a Hidden House Tour, play a Steinway piano, check out the Billiard Room and visit the China Passage Art Gallery. 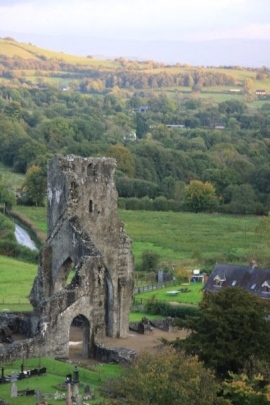 Kidwelly Castle gives an excellent impression of how dangerous life could be 800 years ago when it was in its heyday. 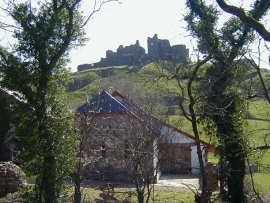 Visitors are able to try out climbing some of the walls as well as appreciate the views down into the castle and surrounding countryside. 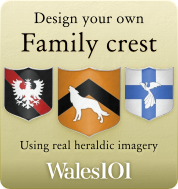 Children are given swords and bows and arrows to ‘defend’ the castle, making it a fun and educational family visit. The Dolaucothi Gold Mines are a fun way to explore the natural surroundings of Carmarthenshire. Visitors are taken into the mines wearing helmets complete with lamps and given a guided tour. Guides take you back in time as they explain how gold was extracted back in the Roman times until 1938 when the mine was shut down. They describe the dismal working conditions of the miners back in the day, which can be quite harrowing to listen to. You can even pan for gold after touring the spooky old caverns of the mine, before enjoying some coffee and cakes at the café.